Selligent Marketing Cloud is changing the face of marketing. Its automated platform helps B2C marketers focus on consumer-first marketing, tailored to individual users. It powers customer relationships for Samsung, ASDA, ING, and more than 700 other major brands in retail, travel, automotive, publishing, and financial services. 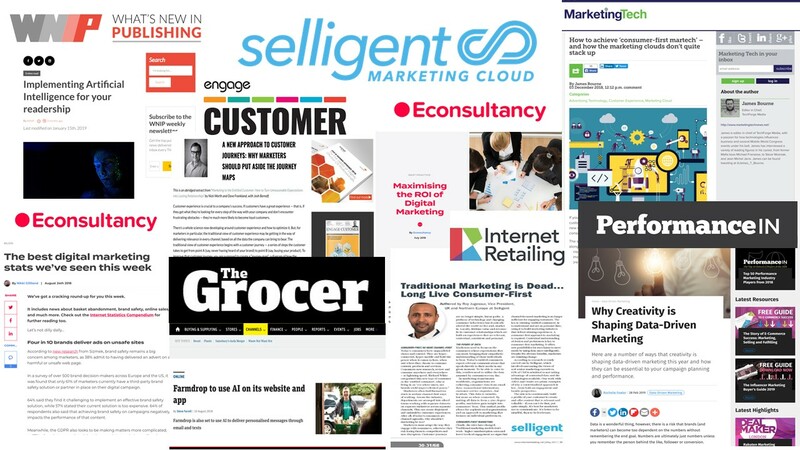 When establishing itself in the UK, Selligent wanted build awareness of its offering across both marketing and vertical audiences including publishing, retail, travel and financial services. The brief was to position the brand as experts in the consumer-first marketing space, helping marketers to respond to this shift, and ultimately increase leads and sales. Our approach involved creating thought-leadership content to position Selligent as experts in relationship marketing within key media. The campaign focused on educating target audiences about the importance of consumer-first marketing, and positioning Selligent as the go-to expert in their field. High-quality thought-leadership coverage has been proven to directly result in new business leads and help convert leads to sales. One major new client of Selligent’s had not been aware of the brand until reading an article in a financial sector publication, and once discovering them via PR invited Selligent to pitch for new business which it went on to win. PR content has also been critical in supporting sales cycles, with the sales team actively sharing media coverage positioning Selligent as experts in its field.